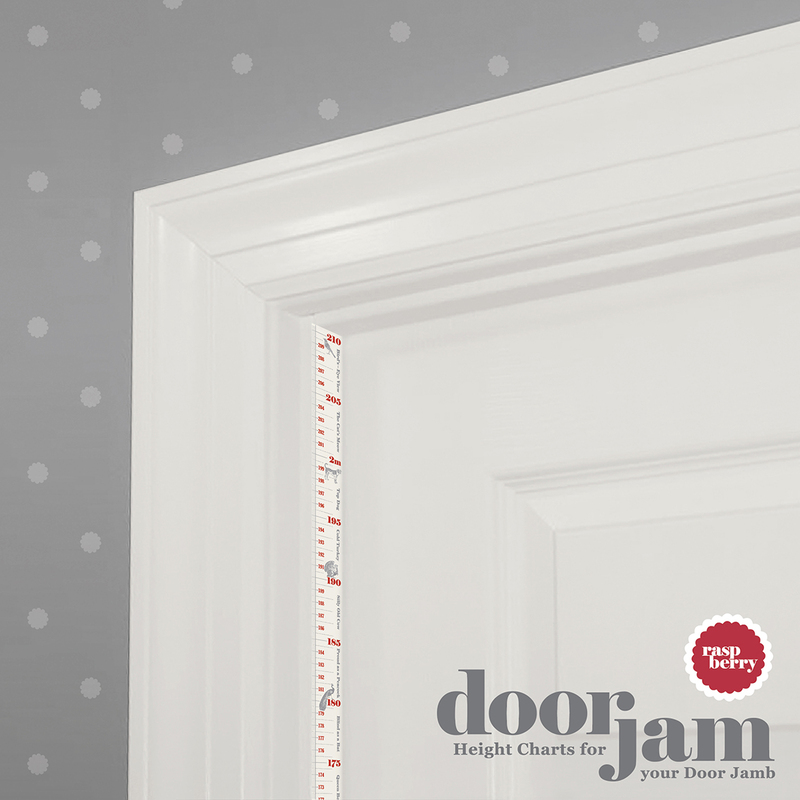 Foolhouse’s Door Jam is the slimmest most unobtrusive height chart in childhood history, at only 30mm wide and up to 2100mm high – it fits in your doorjamb and comes in a jam jar! Every 5cm, Raspberry Doorjam depicts animal characters and idioms to aim for or aim to grow out of! 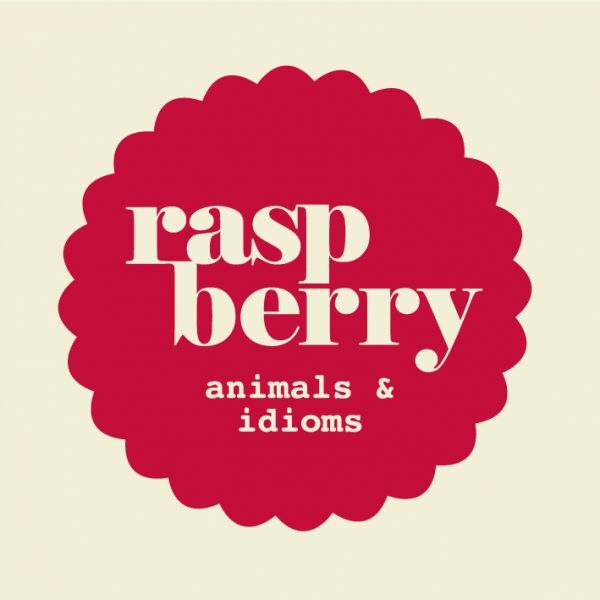 Watch your children constantly checking to see if they’ve matured on from ‘Crazy Cat’ and into ‘Brave as a Lion’ or see them standing on chairs to reach ‘Queen Bee’ and ‘Top Dog’ before their time! These are tall tales to strive for and brings smiles and giggles to all ages! Door Jam, came out of a simple desire to stop people drawing all over their door frames in order to record the heights of their children! The interior designer in me wanted to erase the pencil markings (sometimes biro!) and try to keep people’s worlds and paintwork in order! Then of course, the interior designer in me noticed that people were notching what the industry calls their ‘door jambs’, thus the height chart packaging just had to be a jam jar! 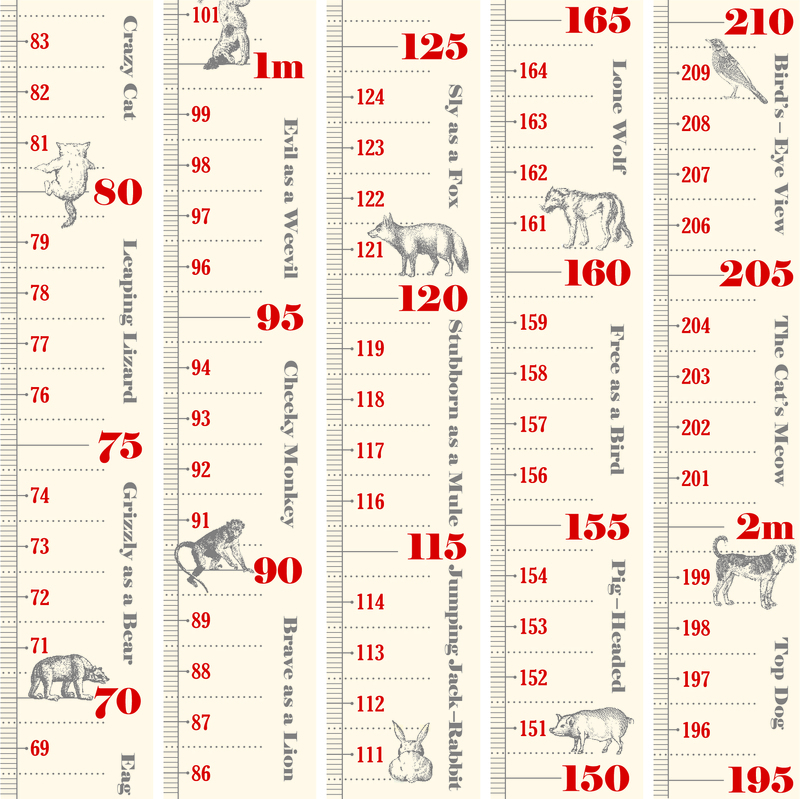 But it wasn’t enough to just have a vintage tape measure, in Foolhouse’s eclectic illustrative style was it? I had always loved the predictive sayings of Mary Poppin’s Measuring Tape. 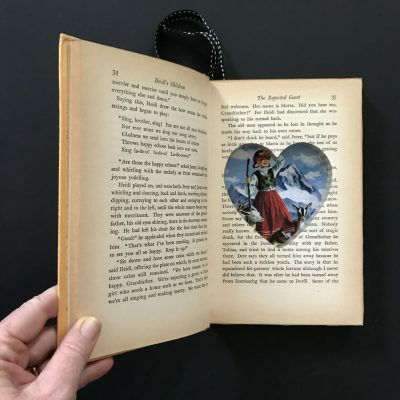 You may remember her pulling it out and measuring Jane’s height to reveal her as ‘rather inclined to giggle and doesn’t put things away’ and then her brother Michael as ‘extremely stubborn and suspicious’… but on measuring herself … she was revealed as being ‘practically perfect in everyway’ – enamoured of this as a child, I wanted to draw upon the idea to include funny idioms about animals and complimentary and not so complimentary (around the terrible two’s height!) character traits that kids will grow into. 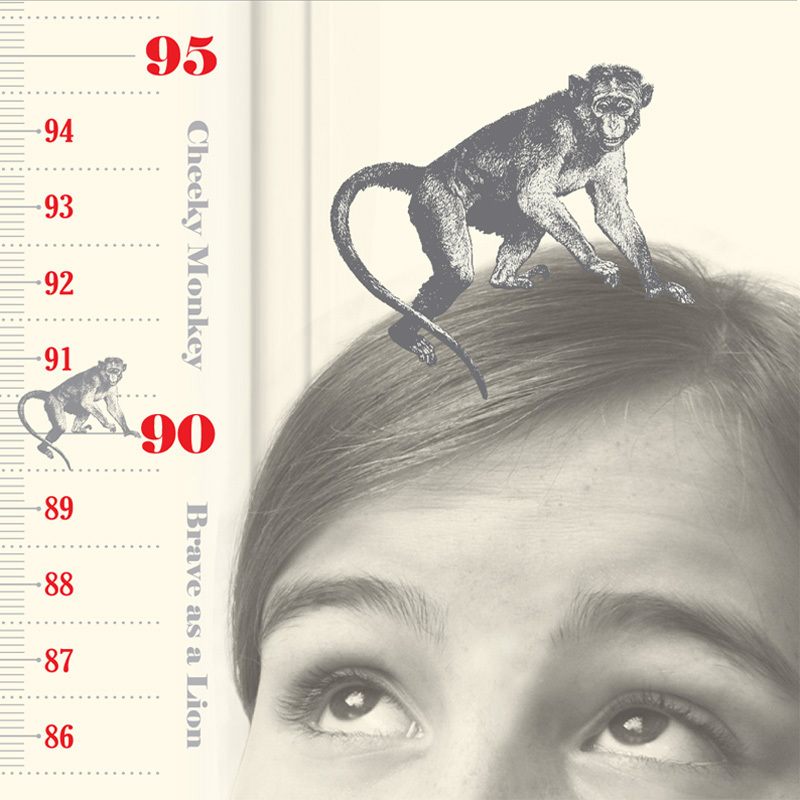 I have been surprised at the age groups that this subtle little measuring tape still intrigues! 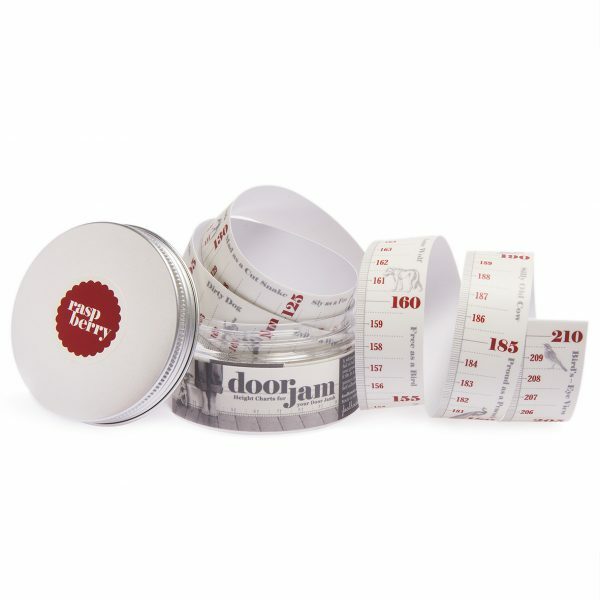 Picking the vernacular of a vintage tape measure, adding in century old etchings and teasing with Mary Poppins’ inspired descriptions or quirky idioms every 5cm or one inch, Doorjam brings smiles and giggles to all ages. 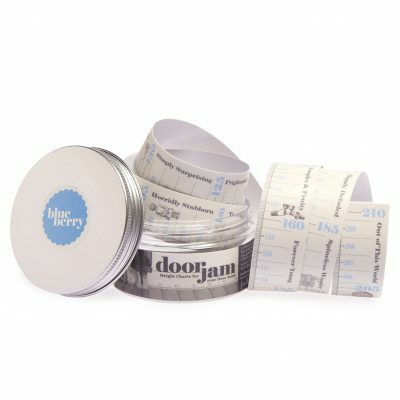 Doorjam is self-adhesive and comes in 5 colours and 5 tall tales. Gogoberry – orange on cream – depicts all things that GO! Planes, Trains and Automobiles, Rockets, Tractors and Scooters! – suitable for boys and girls – although loved by boys with wheel obsessions!! There is room to record names and dates of growth spurts with pencil, biro or permanent marker. The pencil can be erased after the kids have gone to bed if necessary! Doorjam is easily removeable but not always repositionable. Where you put it and environmental factors, will determine the outcome. Mirrors, laminated doors, 2-Pac Polyurethane surfaces & stained timber door jambs are good for removing and re-using but of course it depends if you’re removing it after 10 minutes or 10 years! How you use it and how long it stays there is up to you! Repositioning or stretching the tape many times can also lead to measurement increase but of course your recorded measurements will still be in place for posterity however many of our customers simply restick it themselves or lightly fix it in place first without removing the adhesive backing until an upcoming more permanent location comes up. Please also note that in our endeavour to achieve a digitally printed height chart over 1500mm high – so that our giants do not miss out – and that can also be written on and stable – ‘cos giants are very proud of their stature – we have had to accept that sometimes the anomaly of printing over a 2000mm distance can sometimes add a couple of mm to the length of the Doorjam – an anomaly your kids will love but using it in a health related environment for medical reasons or for a flight attendant application may not be advisable. 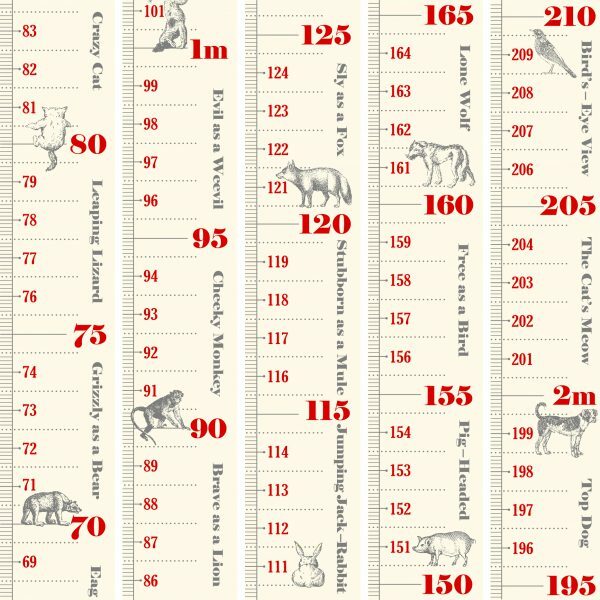 We believe though that the tall tales on these novelty height charts are really where the truth is at and size shouldn’t matter…! I have had many customers buy these for friends who are moving house and want to transfer their children’s heights from immoveable door frames to take with them, just keep the jar and the backing tape. Our packaging is made from brilliant glass clear recycled PET to please the environment and make shipping light, safe and inexpensive. 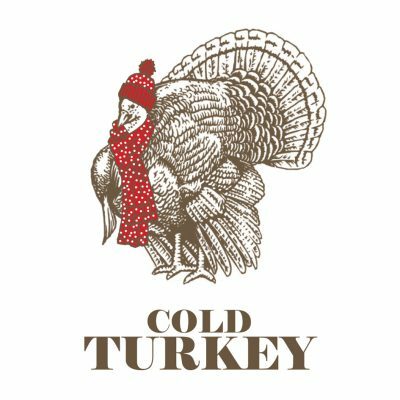 We aim to get packages to the post office within 1-3 working days of receiving your order. 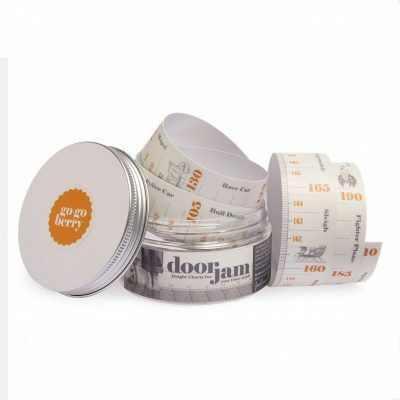 Doorjam is Australian Made and designed. *INTERNATIONAL ORDERS. PLEASE BE AWARE! To keep costs down for you, tracking and insurance is not included on overseas items unless requested, thus if your package goes missing, sorry but we cannot replace it for free. If you fear your package may get lost and don’t want to take the risk, just email us at hello@foolhouse.com.au – to get your purchase covered and if your package does go astray – we will replace it for free. We always get our orders out within 3 days, but after that we are in the hands of the postal service!